The Vapolution 3 desktop vaporizer is a force to be reckoned with. 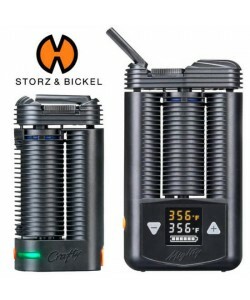 With its ease of use, multiple ways to hit it, precise temperature control, and 100 percent glass parts, it is unmatched in power and smoothness. Very few desktop vaporizers are ready to go right out of the box like the VAP3. Connect the desktop vape to power, set the temperature you want using the easy-to-read +/- buttons at the base of the vape, and give it two minutes to heat up. When it's ready, the digital display will show the vape temperature is identical to the temperature you have selected, and the blue LED will light up the heater sleeve. Then, all you have to do is pack the dry material into the glass bowl, put on the whip, and stick the glass end directly into the heating chamber. From there you will be able to enjoy some of the cleanest, tastiest, purest, most potent vapor available from a desktop vape! Incredibly versatile, the Vapolution 3 Vaporizer delivers the ultimate choice when it comes to consuming the vapor. The V comes standard with a bent glass bowl that connects to the included, medical-grade silicone-constructed whip if you want the classic whip-type pull. If you want to take advantage of the glass-on-glass function, the optional All-in-Wonder Bowl lets you inhale vapor directly from the tabletop vaporizer without tubing or a whip. Furthermore, by using the optional hydro-adapter, the VAP3 can be used with a 14mm water filtration hydrotube that lets you cool and moisturize the vapor at once for an ultra comfortable vaping experience. The Vapolution 3 Vape is the only herbal vaporizer on the market that has eliminated ceramic, plastic, and metal completely from the vapor path. This affords the user an all-glass experience. Since the vapor will never come into contact with anything but glass, the VAP3 will bring the purest, tastiest, untainted vapor of any vape on the market today, portable or desktop. Additionally, you can remove the glass heater sleeve in order to clean or replace it simply! Just turn it on and adjust the temperature to your preferred setting. You can load with your favorite dry herbs without having to first grind them! Vaporization can begin in as little as 2 minutes. Try your hand at a pure vaping experience today! Order the Vapolution 3 Desktop vaporizer now. Unique vaporizer - Review by Danny R.
The Vapolution 3 is a really unique desktop vaporizer. I have tried others before but they seem to be a bit too big and bulky for my liking. It has a nice look to it but it is not really that modern or sleek looking and it could definitely use a little bit of refinement in order to make it a bit nicer looking. Still, just because it does not look that great does not mean that it doesn’t function well. Does the job - Review by Allen D.
It has a nice heating element that really does the job. I love the Vapolution 3 vaporizer. Heats up fast - Review by Willie C.
The Vapolution 3 has a removable glass chamber on the inside that heats everything up perfectly. I love that the vaporizer chamber is glass because it heats up my herb evenly and it makes sure that nothing goes to waste. This also helps with the flavor as I don't have to worry about some metallic tasting residue coming off of it like I do with a lot of other vaporizers. The Vapolution 3 vaporizer heats up pretty fast to the temperature that I set it at so that I never really have to wait in order to vape it. I love the flavor of it and the smell is rather nice. Flavorful - Review by Marty E.
The Vapolution 3 has a really nice heating element that leaves no strange flavors behind like a lot of other vaporizers tend to do. It is a desktop, so of course, I only use it at home. I like that this vape has a lot of aroma and good smells to it as it really enhances the experience. The Vapolution 3 vaporizer also has really great flavor that goes along with it. Great with friends - Review by Justin M.
This Vapolution 3 vaporizer has a pretty deep capacity that makes it great for fitting in around half of a gram. This is good for when I want to vape with my friends. Great taste - Review by Carol M.
The vapor quality of the Vapolution 3 vaporizer is exceptional. The glass preserves the flavor so that it is nice and smooth and the vapor does not burn like it does with some other vapes. I love the Vapolution 3 vaporizer and its small size so that even though it is a desktop vape it does not take up all of the room on my table. No herbs ewasted - Review by Rhona F.
I have a lot of other vapes so that’s important to me. It is efficient and burns up all of the material with ease and without leaving any to go to waste. Outstanding quality - Review by Melody L.
The Vapolution 3 is a nice desktop vape that heats up in no time at all. When I am ready to vape, so is the Vapolution 3 vaporizer. This vaporizer is great for parties and I have found that it can hold up to around a half a gram at a time. Most vapes that can hold this much do not vaporize the material thoroughly but that is not the case with the Vapolution 3 vaporizer. This vape heats up everything easily because it has the glass chamber inside of it. This chamber also gives me really great vapor quality that is outstanding. The taste is unbelievable and does not leech out weird flavors like some of the other vapes that I have tried. A little confusing - Review by Bryan C.
The Vapolution 3 vaporizer can be a little confusing if you have never used a vape before, but the small learning curve is more than worth getting used to. Powerful desktop - Review by Rigoberto M.
It is a powerful vape that is small enough to be compact without being too small to enjoy as a desktop vaporizer. Practice makes perfect - Review by Lynette M.
It is not discreet though, so if you share a home with someone, I do not recommend just leaving it laying out. Using it once you get used to it is simple and you just have to turn it on and pick a temperature. The material just gets pushed down the stem and that takes virtually no time at all so it really is worth getting to know. New favorite vaporizer - Review by Jerry G.
This Vapolution 3 has easily become my new favorite vaporizer. I have used a lot of different ones but this one is so clean, especially when you use it on the maximum setting. There is a good amount of smell and there is no bad taste besides the taste that you are hoping for. This vape doesn’t give me a headache from trying to pull on it too hard and the vapor comes out nice and smooth and does not hurt my throat at all. It is a vape that is unlike any of the other ones that I have tried. It also uses up all of the material efficiently and in such a way that I do not feel like I am wasting my bud. Solid desktop vape - Review by William R.
Overall a really solid vape and I would definitely buy the Vapolution 3 vaporizer again if I needed to. It lasts - Review by Jonathan J.
I have been using Vapolution 3 vaporizer for a really long time and I have yet to get over how much I love it. Glass chamber - Review by Richard C.
It hits as well today as it did the first time I took it out of the box, which is really impressive to me. I like the unique loading style and I love the glass chamber. The glass really gives a lot of flavor without any of the funky flavors that can sometimes come off of other vapes I have noticed. Large capacities - Review by Walter R.
The smell is enough to enjoy, but it does not overwhelm the space, which is good if you live in an apartment like I do.I love that it has such a big capacity as well. I can fit something near a half of a gram inside of it without it getting hard to hit. Not only that, but unlike a lot of other vapes that have large capacities, I do not have to worry about my vaporizer not heating up my material easily and not being able to get all of it nice and vaped. Recommended - Review by Catherine C.
I love the Vapolution 3 vaporizer and would recommend it to anyone who asked. Perfect answer to vaping! That really gets to the heart of it!